This third part of the series by Rudy Martinez on Russians in Boyle Heights and their role in early Hollywood looks at some of the films in which so-called Molokans and fictional representations of the community appeared. In the summer of 1915, Majestic Studios released the first film to acknowledge the presence of a Russian community in Los Angeles. The “two-reeler” was titled Her Oath of Vengeance, starring one of the most popular actresses of the period, Teddy Sampson as a young Russian girl named Sophia. Sampson had just recently played the sister of Pancho Villa for the Mutual Film Company’s semi-fictional film, The Life of General Villa (1914) featuring Pancho Villa as himself. According to the Motion Picture News of August 28, 1915, Her Oath of Vengeance “pertains to life in the Russian colony in Los Angeles, where many of the people are employed in canneries.” The plot includes a worker’s foiled scheme to plant a bomb and incite a strike in the canning factory (this was five years after the infamous bombing of the Los Angeles Times building). Beyond a brief plot description, there is little information about this production, and it appears this film is now lost, so it’s unknown if the filmmakers filmed any scenes in The Flats itself. A screen capture of a scene and title of the 1916 film Sold for Marriage, starring legendary actress Lillian Gish, second from left in the scene. By 1916, The Flats was ready for its close-up. On January 13, the L. A. Times reported that Lillian Gish, who starred in D. W. Griffith's Birth of a Nation the year before, was preparing for a role as a “Russian peasant girl” for her next film. According to the article, she even visited “the Russian colony in Los Angeles and was presented with a shawl by a comely Russian girl.” Recalling her role years later, Gish admitted she did absolutely nothing in preparation for the role except read the script and show up to the set. In the 55-minute film, Sold for Marriage, Gish plays a young girl who aggressively resists her parent’s attempts to “sell her” into a pre-arranged marriage - first in their home village in Russia, and then, after they emigrate, in their new home in the “Russian city in Los Angeles.” The film is notable in that there are a number of exterior shots that appear to be filmed in the Russian Flats neighborhood itself; one scene clearly takes place at the Union Pacific train station opposite The Flats neighborhood on the other side of the Los Angeles River, near the old First Street Bridge. Another notable scene is a brief exterior shot of the Hollenbeck Police Station on First Street, which at the time was called the “Boyle Heights Station.” This might be the earliest example of this police station on film! 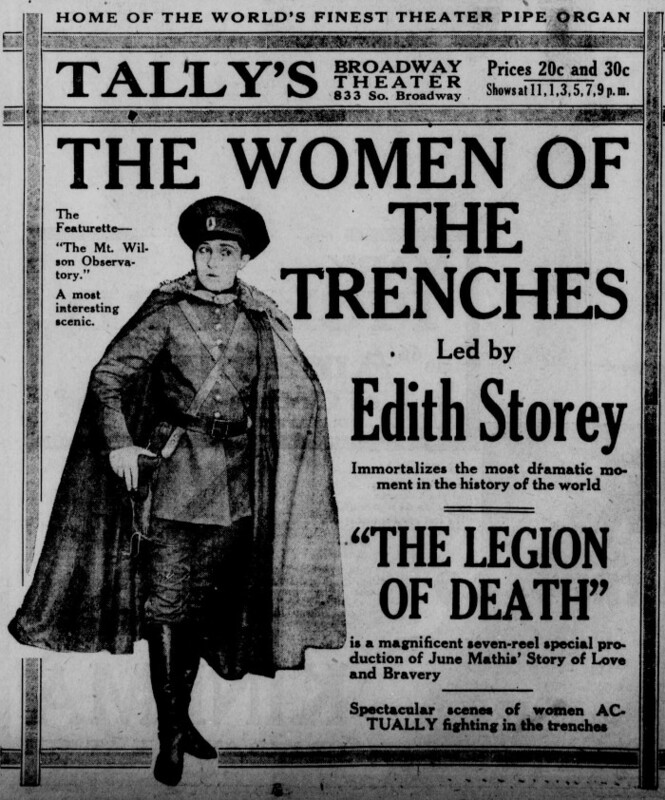 In 1918, Metro Studios released a relatively large-budget film, Legion of Death, based on actual events in 1917, when the Russian Provisional Government organized several all-women combat battalions, including the so-called Women’s Battalion of Death, to fight alongside men on the Russian front. Elaborate scenes of “Russian Battalion women on horseback leaping over enemy trenches” were filmed in the San Fernando Valley. Another title from Sold for Marriage, referencing actor William A. Lowery's character of "Uncle Georg," fictional leader of the Boyle Heights colony of Russian Molokans. On November 4, 1917, the L. A. Times reported that director Tod Browning, future director of the 1931 Universal Studios horror classic Dracula, reportedly “scoured the local Russian colony for real Russian women and men, so they weren’t the regular extras. Seven interpreters were employed to give the director’s orders.” The Motion Picture News for Nov/Dec, 1917 also reported, “The women’s regiment for the film was made up of Russian women who were secured for the scenes from the local Russian colony.” Unfortunately, this film too, also appears to be lost. Like the story of Lillian Gish visiting the Russian colony, the hiring of Russian women from The Flats to portray the film’s female regiment could simply be manufactured studio publicity; there is no way to confirm the claim. Nevertheless, it suggests the Boyle Heights Russian community was by then significant enough to prompt some early Hollywood filmmakers to associate their Russian-themed films with the Russian Flats neighborhood to confer authenticity. By the 1920s, the motion picture business entered a crucial period in its industrial development as the industry consolidated into a handful of major movie companies headed by “studio moguls” who exerted powerful business and political influence. Bigger film productions also demanded quick access to larger numbers of “movie extras,” who were ready and “on call,” since shooting schedules could be abruptly changed or cancelled. If a producer demanded a large number of movie extras with a specific racial or ethnic profile, studios would turn to the production’s “film advisor,” who had connections to a particular neighborhood, and literally bring in a busload of extras for the shoot. Attempting to save production costs and skirt around labor laws, this kind of casting call would even extend to the Russian Flats community. 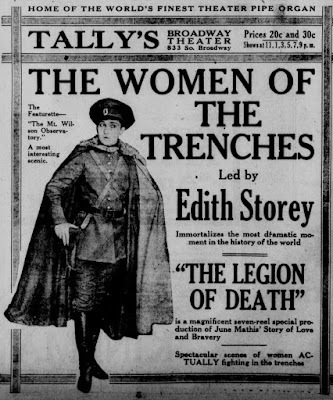 An advertisement for Metro Pictures' 1918 release "The Legion of Death," starring Edith Storey, who acted in over seventy films before her retirement in 1921. Tally's Broadway Theater, in the southern end of the theater district below 8th Street, was demolished in 1929 for an expansion of the May Company (formerly Hamburger's) department store, which was next door. Unionizing efforts by movie extras in L. A.’s open shop climate was generally met with blatant hostility, as exemplified in a 1919 L. A. Times article that reported in an almost gleeful tone about an independent casting agent who “delivered a punch straight to the jaw of a Mexican agitator.” In 1923, a skirmish at a downtown Los Angeles casting office over commission fees demanded by agents, resulted in an armed guard shooting into a crowd and wounding five actors (the office was located where the Mayan Theater stands today). Nevertheless, attempts at unionizing had begun as early as 1916, for example, when the International Workers of the World, or The Wobblies, organized the short-lived International Union of Photoplayers of America. For their part, movie studios continued to promote the romantic allure of working as a movie extra to ensure a continuing union-busting surplus of extras. By the mid-1920s, the California Industrial Welfare Commission had investigated numerous labor violations by the studios that included, demanding extras be on the set 12 to 15 hours straight, or forcing them to wait several hours before being told the shoot was cancelled, then dismissing them without any kind of compensation. Extras often complained their pay only included the time they were on-set but not for the hours they spent in makeup or wardrobe. It’s very possible that local Russians were hired to work on some of the films noted earlier under conditions that violated state labor laws or local ordinances, if any were possibly enacted, or could be enforced, under the city’s robust open-shop environment. Check back next week for the fourth part of the series! Rudy, excellent articles. Do you know what year the old Russian Molokan Cemetery on 2nd street in East LA was first opened? I'm helping a friend visit her grandmother's grave died 1916). Thanks for any help you can provide.